The Iranian government demanded immediate assistance in thwarting the sanctions from the European Union (EU), which remains nominally supportive of the JCPOA, but in practice, there seems little the Europeans can do to satisfy Tehran’s increasingly strident demands. The White House noted that Monday marks the final day of the 90-day “wind-down period” laid out when President Trump withdrew America from the JCPOA. Sanctions will now be restored against Iranian purchases of U.S. bank notes, trade in gold and other precious metals, industrial materials such as steel and coal, software, currency trades, Tehran’s issuance of government debt, and the Iranian automobile industry. The sanctions “snapback” technically occurs at one minute past midnight on Tuesday morning. Another wind-down period lasting 180 days will end on November 4. Sanctions against Iranian energy, shipping, and shipbuilding will then resume, most notably against the petroleum industry. Foreign financial institutions that do business with Iran’s central bank will also face penalties. Hundreds of sanctions against individual Iranian persons and entities will be restored at that time. “President Trump’s decision to withdraw from the Iran deal upheld his highest obligation: to protect the safety and security of the American people. 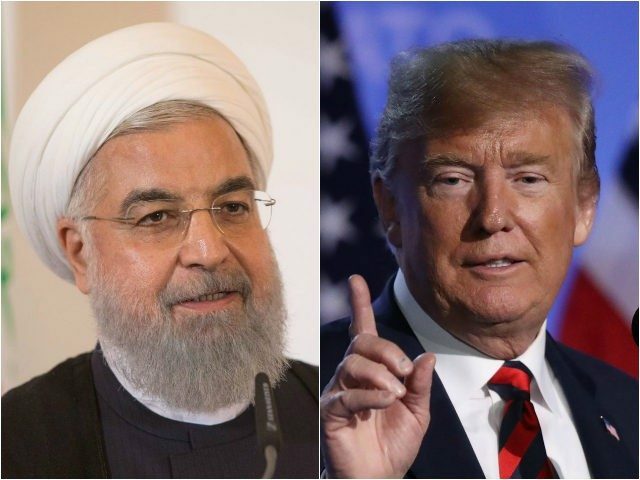 The Iranian regime only grew more aggressive under the cover of the JCPOA and was given access to more resources to pursue its malign activities,” the White House said on Monday. “Tomorrow is an important day, we’ve talked a lot about the world’s largest state sponsor of terror, tomorrow the first set of waivers associated with the wind-down period after the President’s decision to withdraw from the JCPOA will take effect,” Secretary of State Mike Pompeo said on Sunday. Pompeo described the government of Iran as “bad actors” and said the goal of restored sanctions is to make Iran a more responsible, less aggressive nation. “We’re hopeful that we can find a way to move forward but it’s going to require enormous change on the part of the Iranian regime. They’ve got to behave like a normal country. That’s the ask. It’s pretty simple,” he said. The Iranian Central Bank implemented a plan on Monday to deal with sanctions by lifting a ban on exchange offices and permitting “legal institutions and businesses” to import precious metals and foreign currencies. Exchange officers were banned by Tehran in March as part of a government plan to enforce a single unified exchange rate on the rial. The rial lost about a third of its value in the first quarter of 2018 and was trading at all-time lows when the exchange ban was implemented. Radio Free Europe noted last week that Iran’s economy has deteriorated so badly, with black market prices surging and the quasi-legal “grey market” collapsing, that hundreds of thousands of undocumented migrants from Afghanistan have returned home. Iranian officials were filled with bluster on Monday about the strength of their economy in the face of renewed U.S. sanctions, but they simultaneously pleaded with the European Union for rescue. European leaders vowed on Monday to thwart U.S. sanctions and keep the nuclear deal alive. “We deeply regret the re-imposition of sanctions by the U.S., due to the latter’s withdrawal from the Joint Comprehensive Plan of Action. The JCPOA is working and delivering on its goal, namely to ensure that the Iranian program remains exclusively peaceful, as confirmed by the International Atomic Energy Agency,” E.U. High Representative for Foreign Affairs Federica Mogherini said in a statement co-signed by the foreign ministers of France, Germany, and the United Kingdom. “We expect Iran to continue to fully implement all its nuclear commitments under the JCPOA,” they added. The EU is taking legislative action, activating a so-called “blocking statute,” in a bid to protect EU businesses from the renewed U.S. sanctions. But it is unclear how effective it will be in calming the fears of companies, many of which have far greater commercial ties to the U.S. than Iran. Many banks are already refusing to do any business connected to Iran, for fear of being penalized by the U.S. and losing access to the U.S.-dominated global financial system. A senior Trump administration official responded to the statement from Mogherini by saying the United States is “not particularly concerned” by European efforts to undermine sanctions against Iran.